Basic Karate Moves Kihon Waza in Japanese, are the building blocks of all Karate techniques. From novice right through to master, Karate’s most important element and key to superior technique is to practice the basics. 1. The correct relationship between the feet and floor. Karate starts from the ground. 2. Use of the ankles, knees, legs and hips to create stable Karate Stances and powerful Karate kicks. 3. The effective use of the upper body; shoulders, back, arms, elbows and hands to produce dynamic Karate Strikes and Karate Blocks. “Basic” Does Not Mean Easy! If you want to know how to learn Karate take a look, for example, at a perfect golf swing. It looks utterly simple but ask the golfer how she does it and she will tell you, basic practice! A little more attention to the Karate basics and your Karate will be special. Are Karate Basics the Only Secret? No. The basics by themselves are not enough. Practice will make perfect only if you practice the right stuff the right way. What you practice and how you practice are critical to your progress. 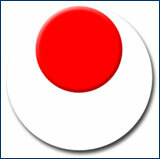 You can get the ‘what’ anywhere - children’s Karate programs, adult Karate programs, free online Karate lessons. These and thousands of Karate books will all show you what to do..
..very few will tell you in any detail how to actually do it. What are the Basic Karate Moves? The fundamentals of all Karate styles are: Stances, Strikes, Kicks, Punches and Blocks. Let’s take a look at these - beginning with Karate stances. Karate stances are common to all types of Karate and Karate forms. They are far more than the dramatic combat postures they appear to be. They keep the body balanced and stable and allow attacks and defences to be made with maximum effect. Basic Karate moves become masterful techniques when the position of the feet, knees and hips all come together to create the right base. The move itself will determine which of the Karate stances is best for the situation. 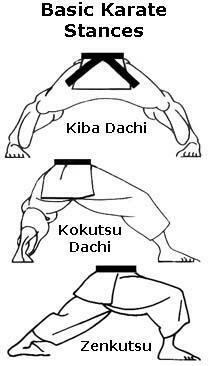 The ‘frozen’ leg positions we see in Karate forms known as kata and basic Karate Moves kihon are ‘point in time’ poses. They are simply the best position to perform against an imaginary fixed target not a real moving one! If Karate stances are ‘held’ a moment longer than necessary, mobility will be restricted giving the opponent a chance to strike. Take a look at any serious kumite match and you will see free-flowing movements not rigid posturing. 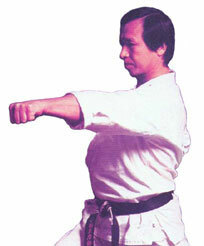 Correct practice of Karate stances strengthens the legs and hips and leads to ‘fluid’ motion. Ultimately the Karateka should not be conscious of stance. A deep, fixed posture is great for training in the basic Karate Moves - but may be fatal in a fight. Practicing Karate stances brings stability and balance, it’s now time to learn some Karate strikes - arm strikes that is. For leg strikes see Karate kicks below. Of all Karate strikes the famous Karate chop is by far the most popular. 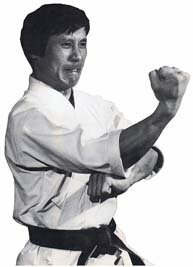 When Karate first grabbed world attention in the 1960’s the Karate Chop became the signature move. 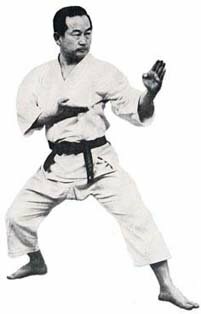 Real name shuto uchi the Karate chop appeared in movies and TV shows as a spectacular and devastating ‘skill’. In reality Karate kicks are more spectacular but the chop was much easier to fake. Of the basic Karate moves Karate strikes are the most versatile and the list of targets is endless. Students of all types of Karate train to maximize destructive power by targeting vulnerable parts of the body. Exposed areas of soft tissue ie the neck, throat, solar plexus and groin are primary targets. Somehow Karate is not best known for its kicks which is crazy because good Karate kicks are extraordinarily powerful. For optimum effect a Karate kick relies on flexibility, a stable stance and good balance. The ball and the edge of the foot, the heel and the instep are all used as striking surfaces or ‘weapons of the body’ in kicking. Karate kicks are delivered with one foot on the floor or both feet in the air. They can come from any direction; front, side or back as a snap, a thrust, a turn, jump or a spin. Some creative ‘kickers’ have devised clever variations to standard Karate kicks. ...is the return path and ‘landing’. 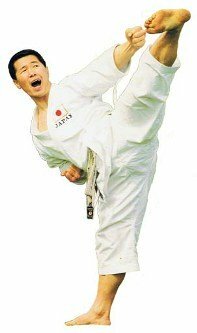 Even if a Karate kick reaches its target, it will lack destructive power if it is not withdrawn sharply. This ‘pull back’ hiki ashi in Japanese creates power in the same way as a whip does. It also gets the leg back under the kickers control and safely out of the opponents range. Karate punches are similar to strikes, but they can be discussed separately. Of all the basic Karate moves, punches are practiced the most. They are taught from the very first lesson and repeated over and over in most classes. 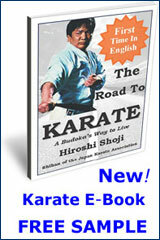 For speed, most Karate punches take the shortest path to the target, a straight line. The main point of impact of the Karate Punch are the two biggest knuckles of the fist. All Karate styles have slightly different ways of performing Karate punches. Some specialize in delivering maximum destructive force from a single punch, others rely on super-fast repetitive actions and some train to hit a precise target with ‘adequate’ force - just enough to subdue an adversary. Karate blocks are used to defend against arm and leg attacks toward any part of the body. They have also been used effectively against weapons attacks. This is not recommended. Most Karate blocks are arm techniques done with a closed fist or open hand, but the legs (knees and feet) can also be trained to block. Skillfully applied Karate blocks will stop or deflect any direct attack no matter how quick or powerful it is. An effective block will avoid a direct hit and give the person being attacked a precious split second to make a decisive counter attack or subdue the aggressor. Of all the basic Karate moves, timing (more than speed) is critical to the success of Karate blocks. A block will fail if it doesn’t ‘meet’ an attack at the right moment. Speed is essential too but it must be used ‘relative’ to the speed of the attack. Karate blocks are usually followed by a decisive ‘counter attack’. This switches the advantage back to the defender. Skilled Karateka can combine perfect timing with the right amount of power to turn Karate blocks into attacks. This is one of the benefits of long term training in the Karate basics. Outside of the dojo, Karateka don’t have the luxury of an opponent pausing to announce his attack. When someone trains correctly in the basic Karate moves there comes a point when there is no conscious decision to block. This is when Karate blocks become instinctive - and just as well because they might just save your life! - All Karate forms (kata) start with a block! - Do you practice the basics..? - How relevant are basic Karate moves..? - What are your favorite basic techniques - and why..?